I’m Irish! (but what’s in a name? Truthfully, there’s only a part of me that’s Irish, but I’ve embraced it for as long as I can remember. 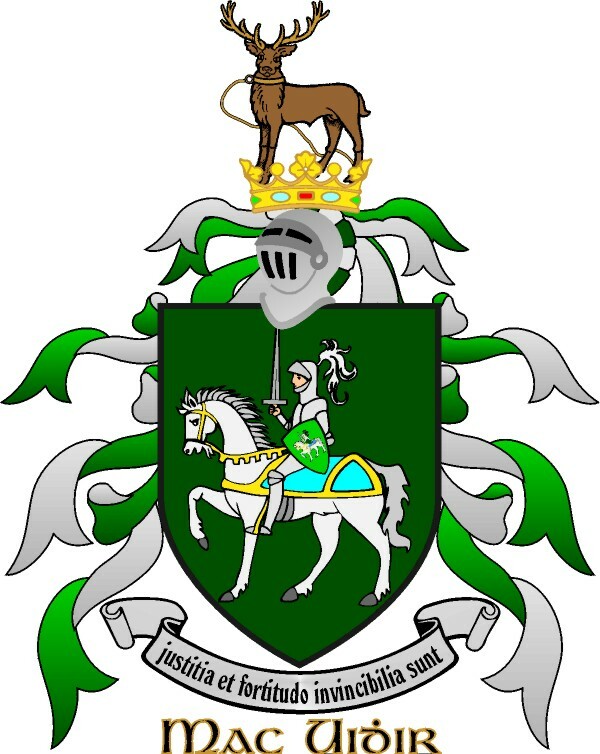 My maiden name was McGuire, and I always thought my Grandfather Henry McGuire was born in Ireland. One of the things I remember best about him is all the Irish stories, true and otherwise, he would tell us grandchildren. Our official family tree, however, places his birth in West Arthurlie, Barrhead, Neilston, RFW Scotland. However, the McGuires (or Maguires) really did originate in Ireland. Maguiresbridge in County Fermanagh (Gaelic: Droichead Mhig Uidhir), takes its name from the family. How did these Irish end up in Scotland? In the 1820s, up to 8,000 economic migrants crossed back and forth across the Irish Sea every year, bound for seasonal agricultural work or other temporary contractual work in northern England, Wales and Scotland…. While most of the temporary migrants and probably a small proportion of the skilled workers eventually returned home to Ireland, some chose to settle permanently…. For my purposes today, it’s adequate to know they did, and some subsequently came to Canada. Girvan was the original spelling of our name. That Glencoe settler was one David Girvan who had been born in Scotland in 1586. 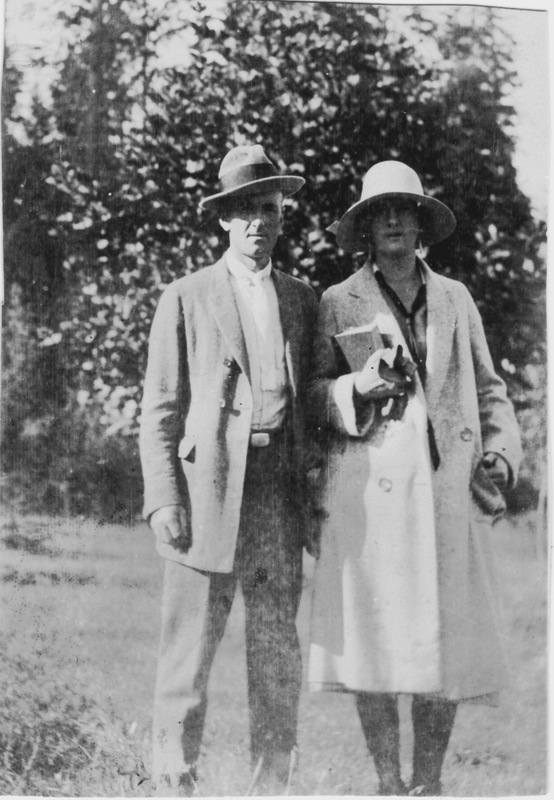 Traced through his lineage, two brothers, Robert and another David, emigrated from Ireland to the United States and then came to Canada in 1831. Robert married in 1836/38 and he and his wife Sarah Vaughan had fourteen children. Yes, fourteen! 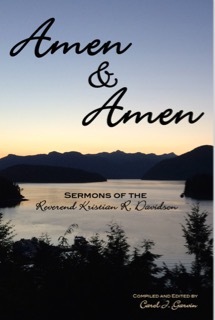 Seven of the girls were baptized, but apparently none of the boys. In baptismal records, spelling of the family name takes various forms, possibly because they were written phonetically, and, as the account suggests, “perhaps the Irish accent added to the confusion.” Two of the girls’ names were recorded as Girvin, one was Girvan, and four were Garvin, as were the parents. However, on his gravestone the father’s name is inscribed as Girvin. Our line carried on as Garvin, although we have relatives in Ontario who use Girvan. Ackk! What confusion! Oh, and the photos here? 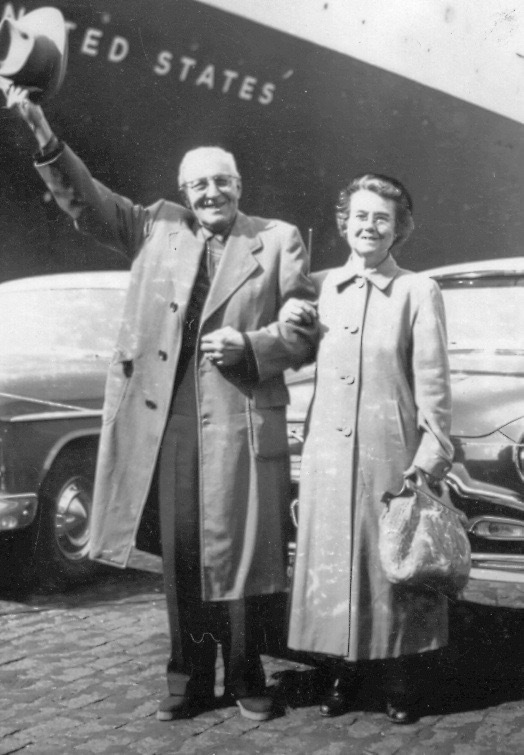 They’re of my paternal and maternal grandparents. I was fortunate to know all four of them for many years, unlike my hubby who had only one of his grandparents and was very young when that one died. There are fewer photos of them but perhaps I’ll hunt them up for a future post. Céad Mile Fáilte — Yes, welcome! “Way back in the olden days…” well, back in 2009, anyway, I admitted to being Irish and I shared a bit of the Irish legend and the shenanigans our family occasionally pursues to celebrate St. Patrick’s Day. The latter involve things like green-tinted milk and green cream cheese and cucumber sandwiches in school lunch boxes, green oatmeal porridge in the morning and perhaps even green mashed potatoes with green beans at dinner time. 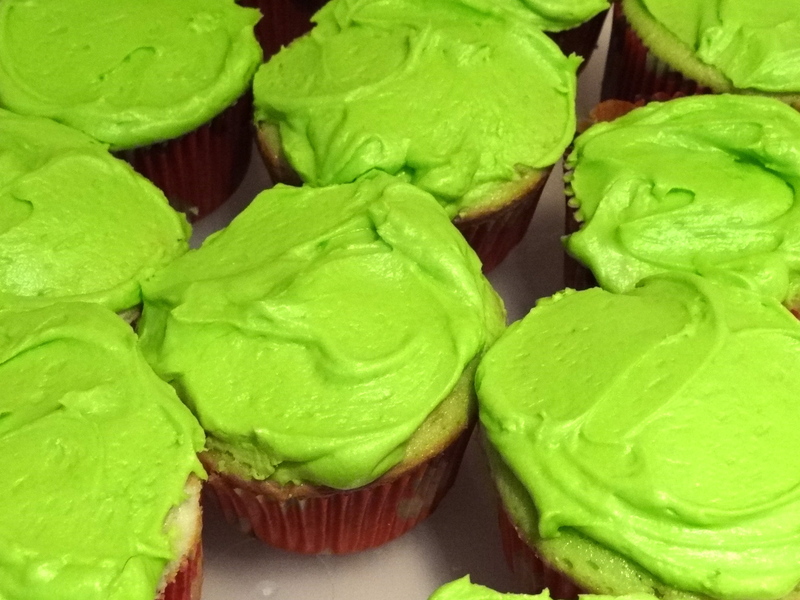 I’ve about outgrown that silliness, although on second thought, I made green cupcakes last year. In honour of the day, I’ve brought back that blog post. I hope you enjoy it. No writing application today, just a Happy St. Patrick’s Day wish for everyone. ‘Tis St. Patrick’s Day and I admit to wearing green. I could just as appropriately have chosen blue, mind you, as blue was the colour associated with Ireland until the mid-1700s. And non-Catholics might well choose orange. So why does green appear everywhere today? Legend has it that St. Patrick chose a shamrock to help explain the concept of the Trinity to the pre-Christian Irish people. As the habit of tucking a shamrock into one’s hatband became a common sign of either Irish nationalism or loyalty to the Roman Catholic faith, references to “the wearin’ o’ the green” began popping up. 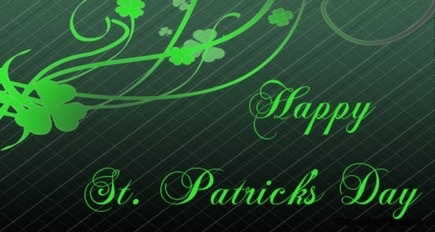 Trust the rest of the world to go overboard with turning all things green on March 17th. Even the Chicago River is green today. We do get carried away, in both sacred and secular circles, as we celebrate the feast day of St. Patrick. But it’s a wonderful excuse to share a bit o’ Blarney with friends. However I draw the line at hoisting a pint of green beer or stout. Just thinking about it makes me feel a little green around the gills! No matter what version you favour, come mid-March there’s really no other green except an Irish one. It was St. Patrick’s Day yesterday. I wasn’t particularly innovative, but I wore green, and my visiting daughter baked a batch of green cupcakes for her girls. There was a time — my children will vouch for it — when there was green porridge in the morning, green milk and green cream cheese sandwiches in the lunch kits, and probably green mashed potatoes at the dinner table. What can I say? I’m Irish, but in a ridiculously Canadian kind of way. Oh, it wouldn’t be St. Patrick’s Day without leprechauns, mischief and a bit of music! However you spent it, I hope you had a great day. As secular as Irish shenanigans may seem, there are some tenuous sacred roots to St. Patrick’s Day celebrations. For instance, it’s said the Shamrock was used by St. Patrick to illustrate the principle of the Trinity to people he converted. While the Shamrock is associated with all things Irish, it’s actually a native of South Africa. 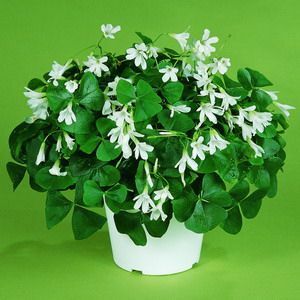 Officially its name is Oxalis Regnelli; it grows from a bulb and produces small white flowers. 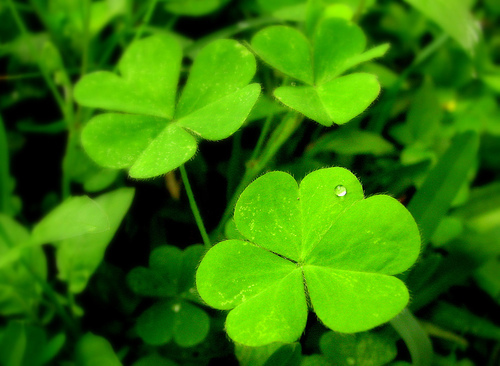 History suggests the Irish people were anything but lucky so where the connotation of Irish luck originated is unclear, unless it has something to do with finding the occasional four-lobed plant among the Shamrock’s usual three. Instead, I’ll raise a glass… mmm, maybe not. I’m not much for Guinness, so maybe it’ll be a mug of Irish coffee*… and offer the following to wish you all a Happy St. Patrick’s Day.